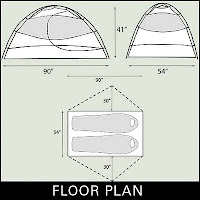 When shopping for a new tent, it is easy to get overwhelmed. There is a wide array of brands, sizes, shapes, structure systems and features that makes tent selection one of the most personal of all your gear choices. I wanted a dual purpose tent, one I can use for just myself with a little room to spare, and I can also use it when I want to take my son. Being that we tend to paddle and portage our way to our favorite campsites, too big and too heavy were not an option. I had narrowed my search to 2 man tents. I wanted a full rain fly and SIMPLE set-up. I mean team of monkeys easy. There is nothing worse than fighting with some crazy pole system in a 20 mph wind and pouring rain. After hours of looking at tents from names like; Kelty, Mountain Hardware and Big Agnes, the REI tents had all the features I wanted for about $50 less than the other guys. I went with the Half Dome 2 HC. With 34 Square feet of interior space and roughly 20 sqft of vestibule, it will be plenty big. At about 5 and a half pounds packed, it will be very managable. Set-Up: 2 equal length poles that make an X. Even I can handle that. 2 large doors, one on each side, make getting in and out easy. 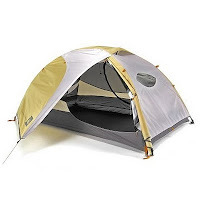 Solidly built and covered by the REI satisfaction guarantee, this was an easy choice.